AUSTIN, Texas -- The Opportunity rover exploring Mars has parked on a sun-facing slope to give its dusty solar panels a better position to generate electricity for the next few months, according to NASA. 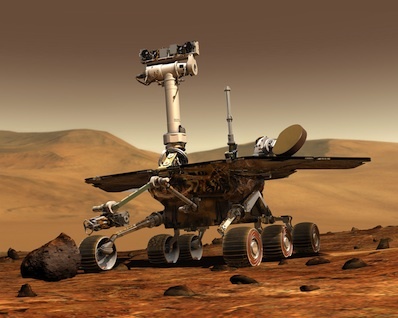 For the first time since it landed on Mars in January 2004, the rover will be stationary for several months to reduce power consumption and ensure it has enough electricity to continue science observations. Spirit, Opportunity's twin rover, parked several times at strategic locations to ride out winters. Spirit became stuck in a sand pit and was not well-positioned for a winter two years ago, and scientists believe the rover succumbed to low power and cold temperatures. The upcoming winter, which reaches solstice March 30, will be Opportunity's fifth on Mars. Opportunity is working closer to the Martian equator than Spirit, meaning it needs a less ideal slope to point toward the sun. An accumulation of dust on the rover's solar panels has reduced their efficiency, so controllers selected a site called 'Greeley Haven' to be Opportunity's home for the winter. The rover will remain at Greeley Haven through at least the middle of 2012 unless a gust of wind wipes the craft's solar panels free of dust. Greeley Haven is an outcrop near the rim of Endeavour crater, a 14-mile-wide impact site that captured the interest of scientists for its clay minerals, which shed light on a warmer, wetter past on the red planet. The park site also provides a north-facing slope for Opportunity, giving its solar panels a 15-degree tilt toward the sun as it sits low in the northern sky. Greeley Haven also offers scientists intriguing targets for the rover's scientific instruments. Officials will use Opportunity's limited power to collect imagery for a full-circle panorama and study the textures and composition of the outcrop. Researchers will also take advantage of Opportunity's static location to measure tiny wobbles in the planet's rotation, revealing insights into the planet's deep interior and core. The investigation requires months of precise tracking of Opportunity's position on Mars and can't be accomplished with the rover on the move, according to NASA. Greeley Haven is named for Ronald Greeley, a Mars rover team member and professor at Arizona State University. 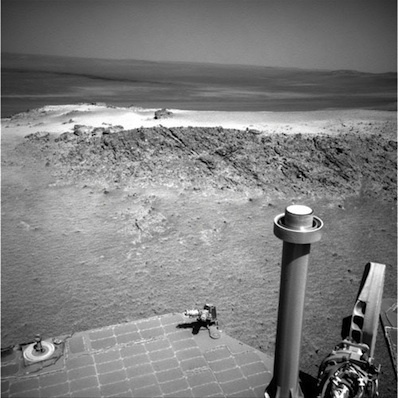 Opportunity reached Endeavour crater in August 2011 after a three-year drive from a smaller crater. NASA's Mars Reconnaissance Orbiter, a sharp-eyed satellite circling more than 150 miles above the planet, spotted signs of clay minerals around the crater's rim and compelled rover managers to order Opportunity to investigate. The clay minerals likely formed in ancient watery environments that may have been mild enough to be suitable for life. Opportunity previously discovered evidence of liquid water at other craters in Meridiani Planum, an expansive dusty plain pockmarked with impact sites, rock outcrops and sand dunes. But Endeavour could hold clues pointing to a less acidic, more ancient environment than from the rocks encountered by Opportunity so far.